Compare prices on car hire in Isla Canela from all the major brands and find the best deals. When you book through us, unlimited mileage and insurance are always included in the price given. Isla Canela is a peninsula that belongs to the province of Huelva and jutting into the Atlantic. The peninsula is located in the country’s southwestern corner and is located on the east bank of the river Guadiana which is the border between Spain and Portugal .Guadiana flows into the Atlantic Ocean just off Isla Canela. The nearest town of Ayamonte is located approx. 6 km to the north and has a population of about 18 000 (2005). 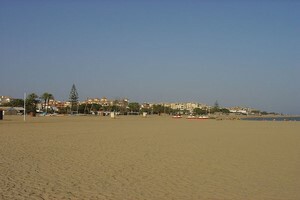 Isla Canela is a resort with a total of 7 km long beach and hotels. The place is becoming more and more popular for soltørste tourists, and here are the possibilities for beach and water activities such as volleyball and windsurfing. Isla Canela is great for both families and others, and in between Ayamonte and the peninsula is an 18-hole golf course with golf courses. To get to Isla Canela you can fly to either Seville Airport which is located approx. 160 km northeast of the peninsula, or cross borders and fly to Faro Airport in Portugal about 50 miles away.